BEST IN SHOW! 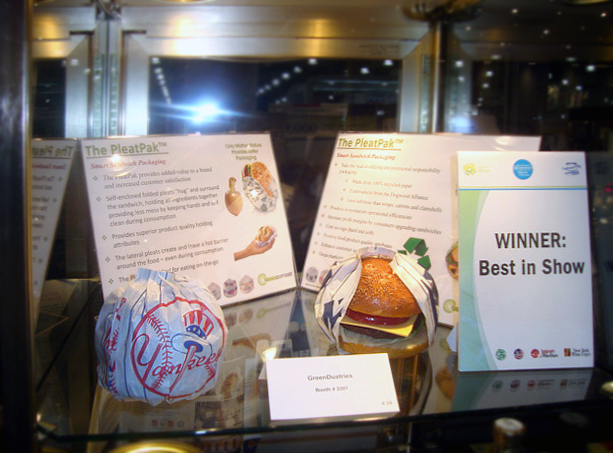 PleatPak by GreenDustries Won Best in Show Award in the International Restaurant & Foodservice Show in New York 2013. 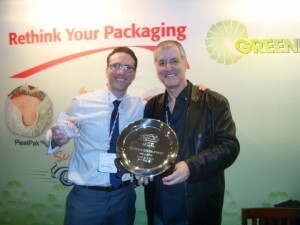 GreenDustries’ PleatPak, a smart, functional, sustainable and innovative packaging, invented and developed by Akiva Buchberg was awarded the prestigious ‘Best in Show’ Award in the International Restaurant & Foodservice Show in New York on March 3, 2013. The PleatPak is being used in iconic places, including Yankee Stadium, Madison Square Garden at Simply Chicken by Chef Jean Georges and at the Daily Burger by Drew Nieporent. You can also find the PleatPak at regional trendy chains throughout North America, including; Hero Certified Burger, Energy Kitchen, Bumpers Drive-In, as well as in universities, food trucks, gourmet burger joints and more. Say goodbye to messy stains or cold and soggy food the next time you order lunch. The PleatPak and Magic Bag give consumers more than a warm and fuzzy feeling; it offers a warm and mess-free juicy sandwiches and burgers that also won’t spill on their lap. The PleatPak is the ‘greenest’ packaging as well. 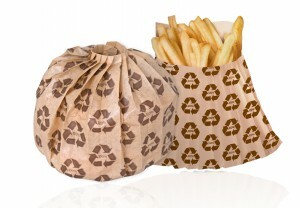 It’s made with 100% recycled paper and has the smallest footprints for to-go packaging. 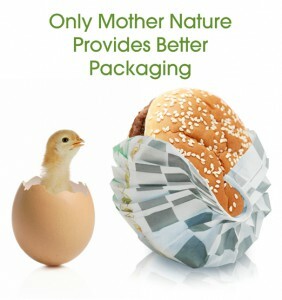 The PleatPak a superior packaging concept, but champions of source reduction and the best package for the environment as well. We at GreenDustries think that we should do all we can to take care of our environment. We have only one planet “Earth” a beautiful blue planet, the only one known to sustain life in all the cosmos. All the research that was done and the missions that NASA launches to try to find another planet with the possibility to welcome the human race did not succeed until today no matter how many billions of dollars were invested in the process, Frankly we can do better. “What amounts to a stalemate in its consideration of climate change legislation, and it’s not clear how long this self-imposed hiatus will last.” “Proponents of a cap-and-trade approach to limiting CO2 have failed to make a compelling case for adoption of a trading mechanism that establishes a price on carbon. Likewise, opponents to cap-and-trade have created considerable doubt in the public’s mind about the cost of that approach, particularly what effect those costs might have on job creation and economic growth,” he continues. While the merits of cap-and-trade continue to be debated Earth keeps getting warmer, he says, and many in the scientific community believe this rise in temperature will cause dramatic changes worldwide at varying rates – not just the relatively rapid changes that already have been observed, for example, in the melting of glaciers worldwide and the Arctic and Antarctic ice shelves. “Reasonable people may disagree over what all this portends for future generations, but there is a growing consensus that significant changes are on the horizon,” Cooke emphasizes. So, given what we now know, he poses, what can or should be done about global warming before Congress gets around to dealing with the issue? In Cooke’s view the U.S. should adopt a “no regrets” approach to global warming. “Stop the finger pointing, stop waiting around until conditions force our hand, and start taking action now. There are things we can and should start doing something right away to mitigate some of the harm that a majority of the scientific community believes will result from the rise in global temperatures.” All levels of government should better understand the effects of increased warming within their local areas of jurisdiction, he explains. Many coastal communities know they can expect increased sea levels. Now is the time for them to begin planning what that will mean for residential and commercial beachfront property owners, as well as public parks, roads and bridges, and other public infrastructure. “Other areas of the country, already dealing with drought conditions, can expect to grapple with increased scarcity of water resources. Now is the time for local officials in these areas to begin assessing how water usage needs to be changed, particularly in agricultural areas,” Cooke writes. The point is, Cooke stresses, to start now. GreenDustries agrees that while our government officials debate policy, our Earth is in dangerous need of help. We each should do a part in preparing for what’s to come and finding solutions. We can’t wait to see how Congress handles the problem. We need to handle the problem ourselves. As much as governments will issue legislations and directives, nothing with change unless we consumers and industries will take a proactive action. At GreenDustries we did not wait for the law to push us and long ago we took the initiative to combat environmental problems in our industry. 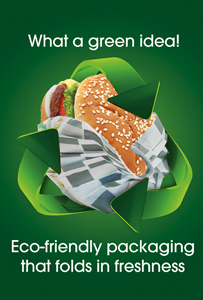 With foresight, we developed our first fast-food packaging products; the PleatPak and the Magic Bag to minimize and/or eliminate many environmental and the industry’s problems. We make all our products with 100% recycled paper. Our products being the champions of source reduction and has the smallest foot print and minimize carbon emission, energy and waste. 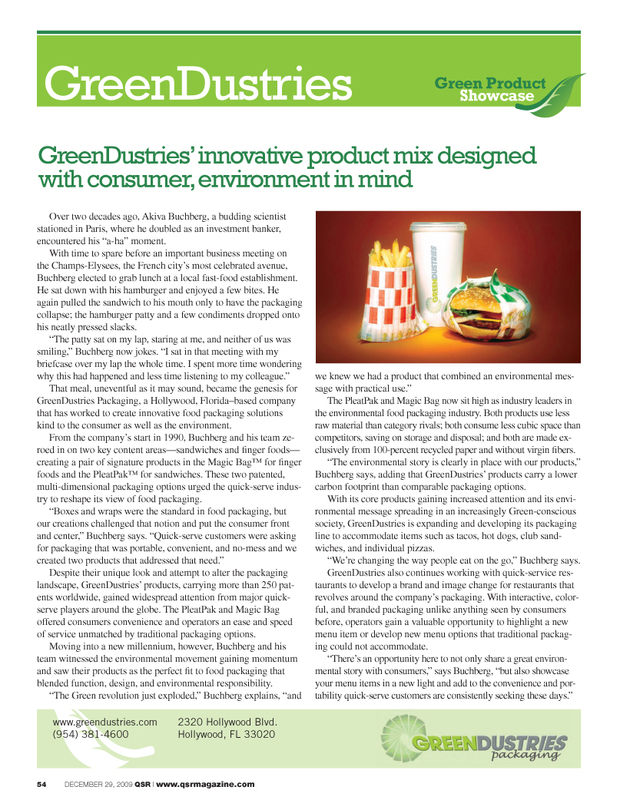 We took a risk in doing so as the packaging industry is not known for mind-blowing innovations and R&D. It is costly at first to make a change and driven by the bottom line most company will talk about environmental improvements but will do very little about it, if anything. At GreenDustries we are very proud knowing that our products have a real and important lasting impact on helping to keep our planet clean and Green, we wish that other will follow or join us for a better tomorrow for us and our children. venues and at farmer’s markets – where people enjoy easy-to-eat portable snacks. Biodiversity: Polar Bears and the Poles’ Melting Ice. A WORLD WITHOUT PLASTIC. Switching to Biodegradable material.